Patrick Lower officiates at the state level. Jude Kiah officiates his third and final state tournament. 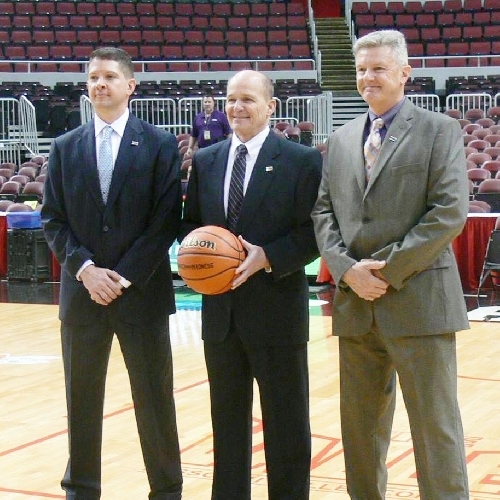 Jeffrey Rutledge, a native of Macomb (IL), is the 10th official in IHSA history to work a state final in football, basketball, and baseball. MACOMB, IL — The journey to being selected as an official for the Illinois High School Association (IHSA) boys' state final basketball tournament isn't an easy one. Three Western Illinois University graduates, Patrick Lower, Jeffrey Rutledge and Jude Kiah, accomplished this task in March 2015 after decades of hard work. Lower and Rutledge said they attribute a lot of their success to the time and effort Kiah put in to their training as officials. "Jude tries to help everyone out along the way," said Lower, a physical education teacher and driver's education instructor at Fulton High School (IL). Lower began his journey in the IHSA when he was 18 years old at WIU, 21 years ago. "Pat got a great start here at Western," said Kiah. "I remember assigning him fifth and sixth grade games when he started and here he is, all these years later, going to the state tournament in his late 30s. It's wonderful. He's so deserving." Kiah is currently the director of Go West, the WIU Bookstore, and has been the basketball chairman of the Western Central Officials Association (WCOA) for 18 years. 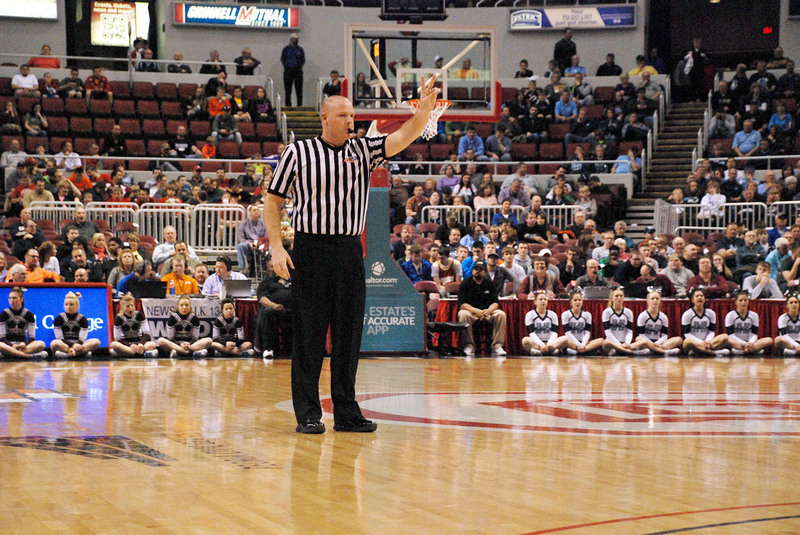 The 2015 IHSA state tournament was Kiah's third and final trip to officiating at the state final level. It was Lower's and Rutledge's first. Kiah's sacrifice and dedication has not only shown in his own journey to the state tournament, but in his fellow WIU alumni as well. Because he has been training officials for so long, Kiah has learned what it takes to make it to the top. "I've been officiating from November to March at least three times a week for 27 years," Kiah said. "The sacrifice and dedication it takes, over a long span of time, it's not just an arbitrary thing, you have to build to it." 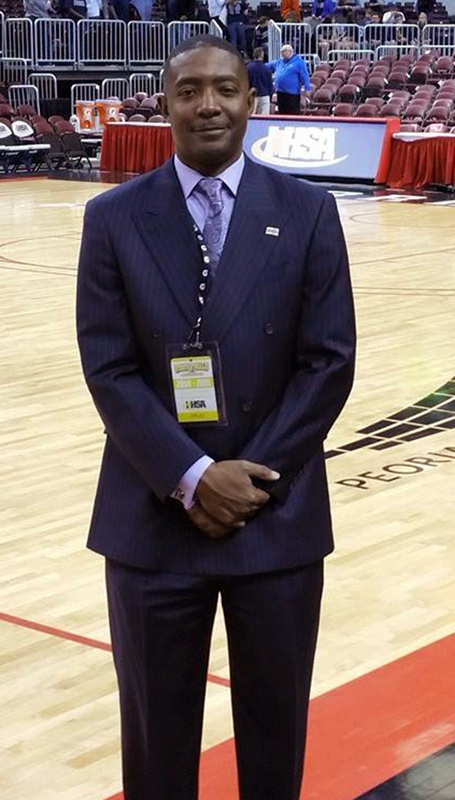 Kiah began officiating in 1988 and came to Illinois in 1995. It wasn't until 15 years later that his dream of going to the state tournament was realized. Kiah said it takes a very high level of focus to achieve the dream, and both of his colleagues have this similar focus. "You could tell even when they started they had a lot of commitment, they were very focused and both incredibly talented. I'm very proud of them," Kiah said. "More than that, they are good people. They are all we want Leathernecks to be. Humble, hard-working and focused." Rutledge, a native of Macomb, who now lives in Naperville (IL) and works in insurance sales, is the 10th official in IHSA history to work a state final in football, basketball and baseball. In his 19 seasons of officiating, Rutledge said that he has followed Kiah's philosophies and attitudes when it comes to officiating. "Jude set a tone for my career early on when I met him in my first year of officiating," Rutledge said. Kiah said that he knew right away that Rutledge and Lower had what it takes to get to the state level. "One in 10 officials are what I call 'getting into the system,'" explained Kiah. "This means there are one in 10 officials who say, ‘I want to do this long term.'" Once officials get past that point, Kiah said it becomes a matter of, "Is this something you want to make sacrifices for long term, and is this something you want to commit your focus to?" Kiah, Lower and Rutledge have all made it beyond this point in the process—in record time. Kiah said the average time it takes for an official to get to the state tournament, if he or she is ever selected, is 22 years; all three Leathernecks did this in less than 15. "Going to the state tournament is what every basketball official dreams of doing," Kiah said. "These guys have reached the very pinnacle of their avocations. One half of one percent of officials ever will. It's pretty special what they've accomplished. For them both to have made it in the same year, it's amazing." Without the help of Kiah and Western, Lower and Rutledge might not be where they are today. "Western helped shape me into who I am today, both as a professional and as a basketball referee," Lower said.